Friendly contests was the order of Show Day Two with blue ribbons up for grabs. It started in the cattle area with a six way sausage making contest, beef, of course, while the temperature was still hovering not much above freezing but the sky, naturally, was its usual brilliant blue. 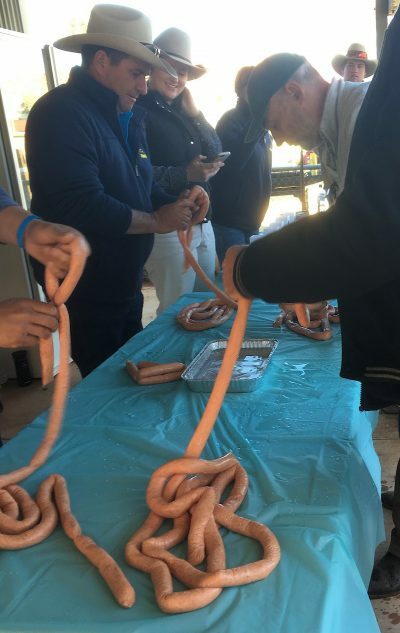 The judges gave Undoolya Station the nod for their snags, Bryan Gill was the people’s choice while Ashley Severin won the tie-off which involved tying some five metres of sausage into neat foot-long sections, with your bare hands. Mr Severin prides himself of the liberal chilly content in his sausages which are reputed to burn twice. Pictured (from left) are Ben Hayes, from Undoolya, watched by Shannon Hayes, and Mr Severin. The more serious part of the cattle section was the sale of 45 bulls ranging in price from $3000 to $10,000, with $4300 as the average. 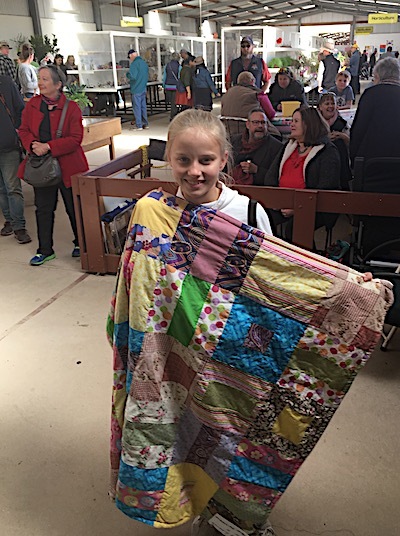 In the indoor sections, Tilly Loader, 11, (above) and Raewyn Swindells (below) excelled with quilts. Tilly took one week to make hers. 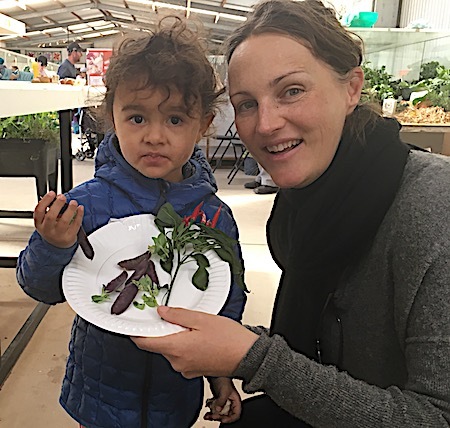 Adi Madabushi (above) topped the agriculture section with chilli and snow peas, while his mum, Dr Anna Madabushi, entered this bounty from the Community Garden (below). Long-time agriculture stewart Geoff Miers says: “In the last 10 years it’s been increasingly difficult to get people involved but we’ve managed to maintain the standard. 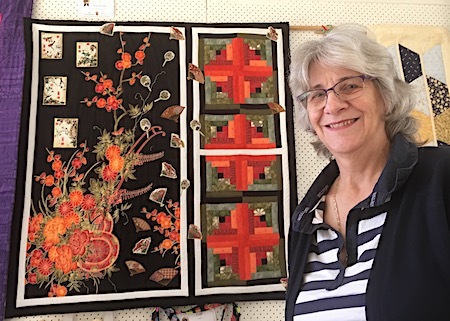 There are 100 plus people who’ve put in exhibits. 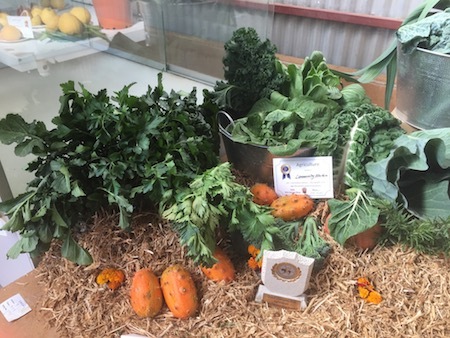 In Mr Miers’s section were some outstanding entries, mostly from back yard gardens, he says: “The citrus section is always popular, there were probably 60 entries. Eggs have been very good this year, and a lot of the greens. For some reason this year broccoli is really popular. Last year there were hardly any entries in that section. Catching up for a chat in the sideshow part of the show. 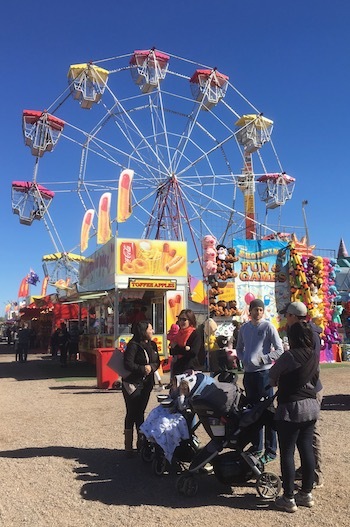 The Show has once again broken the attendance record following a record year in 2017, with more than 22,000 people through the gates, according to the Show Society. It says the competitive sections also enjoyed a bumper year with 2,646 entries across almost 30 sections including cattle, horses, dogs, poultry and the pavilion sections. Trade space was at capacity across all areas of the Show, with local and interstate businesses promoting their goods and services.